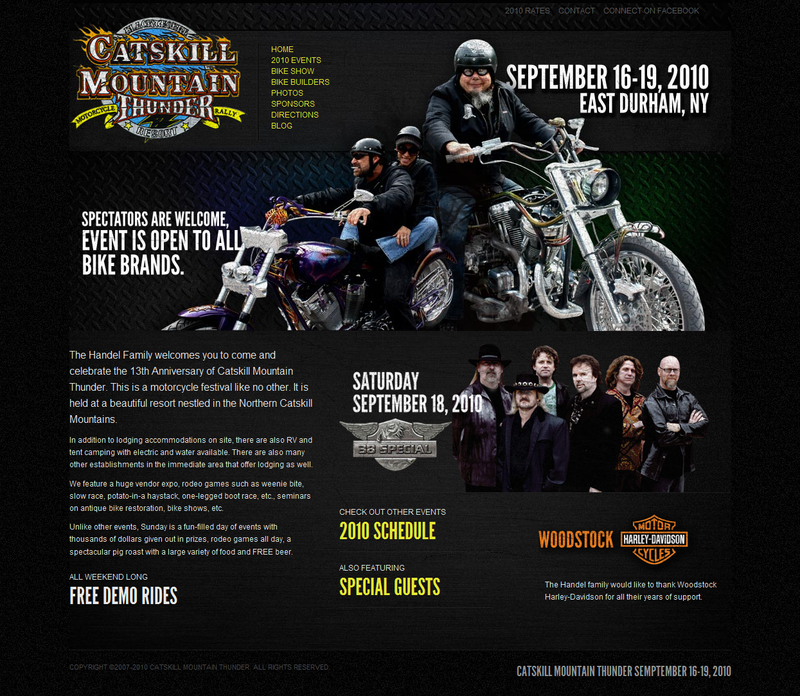 Catskill Mountain Thunder Launches New Website And Facebook Fan Page. 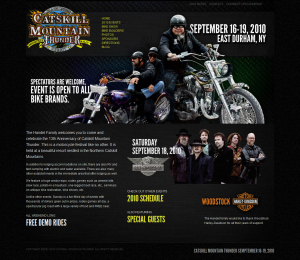 Hello Everyone…As you all know this year is the 13th Anniversary of The Catskill Mountain Thunder Motorcycle Festival. This is a motorcycle festival unlike any other. It is held at a beautiful resort ( Blackthorne Resort ) nestled in the Northern Catskills. The Handel family ( resort owners and festival organizers ) knew that with the power of social media and social networking, it was time to take the festival to the next level. The Handels made the decision to hire Marknet Group Inc a web design and internet marketing firm that specializes in high end web development and online business strategy. They wanted a website that would have an immediate impact on visitors. Gina Nieves of Marknet Group, also advised Blackthorne’s Jennifer Handel, to immediately create a Catskill Mountain Thunder Facebook fan page which would be integrated with their new cutting edge website. Links are all in yellow. You now know that anything that is yellow is a link. How is that for easy! An easy to read events page. If you are looking for events on Saturday, instead of scrolling all the way down, all you have to do is click on “SAT” ( highlighted in yellow) and it will drop down to all the events featured on Saturday. The same goes for all of the other days. Bike builders page showcases all of the custom bike builders who will be there. You can also view enhanced images of their work and visit their website. Photos page will include various enhanced images of the event. We will also be including videos of the event. You can now get directions to the festival by typing in your location in the directions page. We now have a blog. we will be blogging about bikes, music, tattoos….any suggestions? You can add comments about whatever is on your mind. The contact page now includes a contact form. Feel free to ask us anything you wish to ask or request. Another hot feature is the special guest page. It will have images and videos of the special guest along with information about them. Another great feature is the ability to navigate the website from any page. You never have to go back to find a page. And of course….You can now connect to our Facebook fan page right from our website. Please make sure you follow us on facebook and post whatever is on your mind. We hope you enjoy our new website. If you have any suggestions please feel free to comment. We look forward to seeing you at the festival.